Cows stand in a pen at the Skyline Dairy farm near Grunthal, Manitoba, Canada, in March. 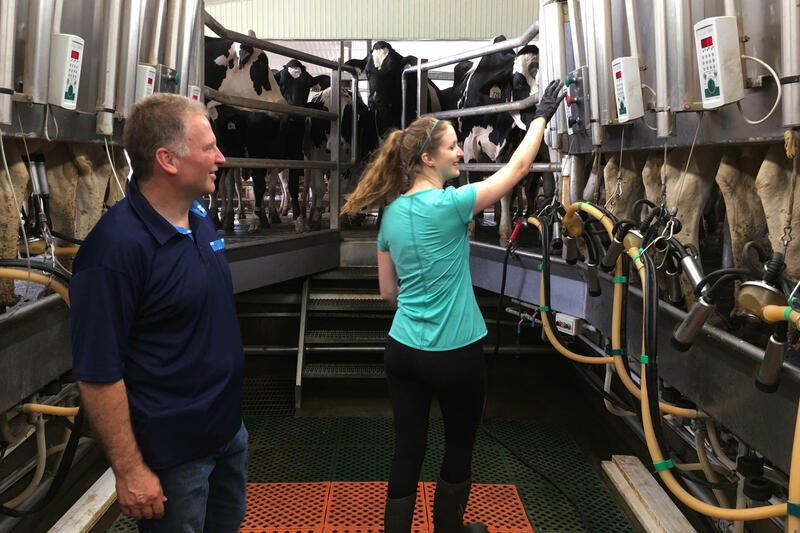 "By somehow opening up the Canadian market to American producers, it is not going to solve their overproduction problem," says Murray Sherk, the owner of the family-run Pinehill Dairy in Plattsville, Ontario, here with daughter Melodie Sherk. "What they need to have is some way of controlling production, because the market just gets flooded." President Trump has railed against Canada for taking advantage of the U.S. when it comes to trade. A particular point of criticism is the dairy industry. Canada slaps steep tariffs on imports of milk, cheese and butter from the U.S., something Trump has called a "disgrace." Trump may not like it, but those tariffs are part of a politically sensitive, decades-old policy to protect Canada's dairy farmers. The system is called "supply management" and it sets production quotas for the country's dairy, poultry products and eggs. Murray Sherk, the owner of the family-run Pinehill Dairy in Plattsville, Ontario, says supply management helps keep prices stable, gives farmers a steady income and has succeeded in avoiding a milk surplus in Canada. "The stability of our system is of great benefit to not only farmers, but also all kinds of other businesses," he says — like restaurants and trucking. But other countries, including the U.S., see the system as protectionist, in large part because of the high tariffs Canada places on dairy imports. They range from 241 percent for milk (and more for dried milk) to 300 percent for butter, according to the Dairy Farmers of Ontario. Those tariffs kick in after imports have reached a certain quota. In the case of the U.S., once it reaches its annual quota of 3,274 metric tons of butter to Canada, tariffs of 300 percent are applied. President Trump has called the steep tariffs unfair. But Graham Lloyd, the CEO of Dairy Farmers of Ontario, says Canada's supply management system wasn't designed for Canadian dairy farmers to compete with the U.S. It's intended only for domestic use. "We're not challenging them internationally ... we don't increase production with a view to saying, 'let's go and pursue a Mexican market' or 'let's go in pursuit of a European market,'" he says. "It is designed for domestic consumption, so it's a domestic policy." Lloyd notes that in recent years, the U.S. has had a trade surplus with Canada in dairy products. The U.S. exported more than $600 million of dairy goods north of the border last year alone — more than four times the amount Canada sent to the U.S.
Trump is trying to protect dairy farmers in states like Wisconsin and New York, who have been hard-hit by low prices and overproduction. But dairyman Sherk says it's not fair to blame Canada for a glut of U.S. milk. "By somehow opening up the Canadian market to American producers, it is not going to solve their overproduction problem. ... What they need to have is some way of controlling production, because the market just gets flooded," he says. It was the effort to reduce a constant surplus of Canadian milk during the 1950s and 1960s that led to the supply management system, says Al Mussell, an agricultural researcher at Agri-Food Economic Systems, an economic research organization in Guelph, Ontario. "We found ourselves in a situation of chronic surplus, low prices, very low returns to farmers, just chronic agony," he says. "We eventually stumbled on this idea that maybe we could use a quota to limit production." Supply management has enjoyed popular support from farmers in Canada over the years. Lloyd with the Dairy Farmers of Ontario says there has been no volatility in supply, and it's helped keep small dairy farms in business. It has become an integral part of the economy, he says. "I think what people need to understand, it's more than an economic model. It's not just a political policy. It's a fabric of what this country is. It's part of our strength of our rural economies," he says. The system is also politically sensitive. Dairy farmers are a powerful group, and many farms are located in heavily populated Ontario and Quebec. Maxime Bernier, a member of parliament, was reminded of that power recently, when he wanted to abolish the supply management system. He lost, by a whisker, his bid to lead the Conservative Party, says Gordon Ritchie, who served as Canada's ambassador for trade negotiations in the 1980s. "He lost — in his view, and in the view of most — largely because the dairy farmers mobilized a lot of votes to tilt the convention, the count against him," he says. Sylvain Charlebois, a professor in food distribution and policy at Dalhousie University, says Canada is the only industrialized country in the world that has such a system. Other countries, including New Zealand, South Korea and the U.K., got rid of their supply management policy years ago, in part to become more focused on exports. Charlebois says that puts Canada "on the defensive." Canada came under pressure in past years from negotiating partners involved in the Trans-Pacific Partnership (TPP). Stephen Harper, Trudeau's predecessor as prime minister, agreed to undo supply management in exchange for entry to the TPP. When President Trump pulled out of the multilateral trade deal soon after taking office, the Canadians took supply management off the table. Charlebois says if Canada wants to be taken seriously as a trading nation, it needs to rethink its supply management system — but abolishing it outright would create even more problems. If that were to happen, "I would say within five years, Canada would lose most of its dairy farms," he says. "It is losing, Canada is losing dairy farms already. But I would be surprised if any of the farmers would survive within five to 10 years, given how competitive Canadian farms are — they're just not competitive, and dairy in particular." Canada is one of the countries that President Trump has accused of taking advantage of the U.S. when it comes to trade. 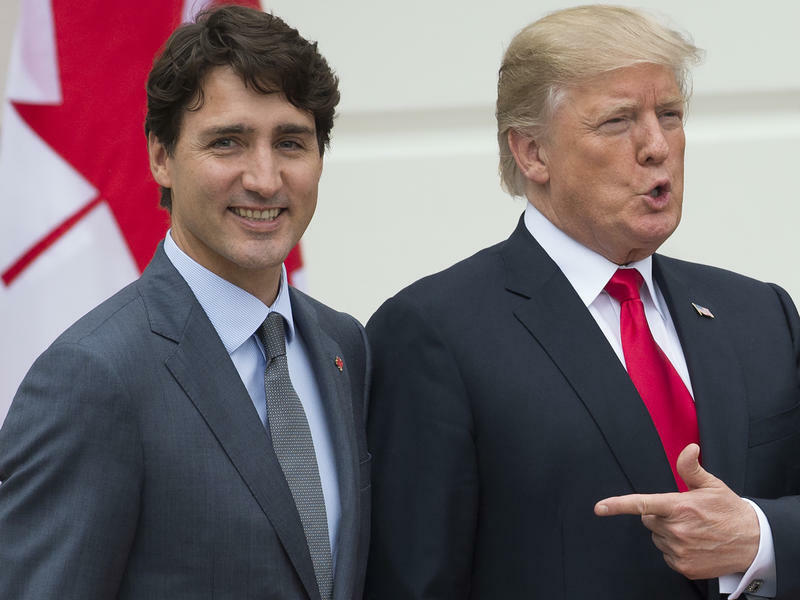 He's explicitly called out Canada for slapping tariffs of more than 270 percent on U.S. dairy products. The Canadian dairy industry is protected by a decades-old system. NPR's Jackie Northam talked to Canadian dairy farmers about how that system works and what changing it would mean for them and for the U.S.
JACKIE NORTHAM, BYLINE: President Trump has railed against Canada's dairy industry, calling the country's steep trade barriers on milk, cheese and butter a disgrace and that the U.S. will not stand for it. The president may not like it, but those tariffs are part of a politically sensitive, decades-old policy in place to protect Canada's dairy farmers. MELODIE SHERK: All right. Let's go. NORTHAM: Melodie Sherk gently prods black and white cows towards milking machines at the Pinehill Dairy, her family-run farm in Plattsville, Ontario, about three hours from Detroit. It happens three times a day for the more than 100 cows on the farm. MURRAY SHERK: So the milk is flowing out of the cow now through a meter into a line. NORTHAM: Murray Sherk, the owner, knows in advance how much milk his cows are allowed to produce and how much he'll be paid. This system, called supply management, is the backbone of Canada's dairy industry. It was introduced in the early 1970s and has succeeded in avoiding a milk surplus, says Sherk. MURRAY SHERK: The stability of our system is of great benefit to not only farmers but also all kinds of other businesses. NORTHAM: But other countries, including the U.S., see the system as protectionist in large part because of the high tariffs Canada places on dairy imports. They range from 241 percent for milk to 300 percent for butter. The tariffs kick in once a country has exported its quota to Canada. President Trump has complained those tariffs are unfair. But Graham Lloyd, the CEO of Dairy Farmers of Ontario, says Canada's supply management system is for domestic, use not competing with the U.S.
GRAHAM LLOYD: We're not challenging them internationally. We don't increase production with a view to - saying, let's go and pursue a Mexican market, or let's go and pursue a European market. It is designed for domestic consumption. So it's domestic policy. NORTHAM: Lloyd says in recent years, the U.S. has had a trade surplus with Canada in dairy products. 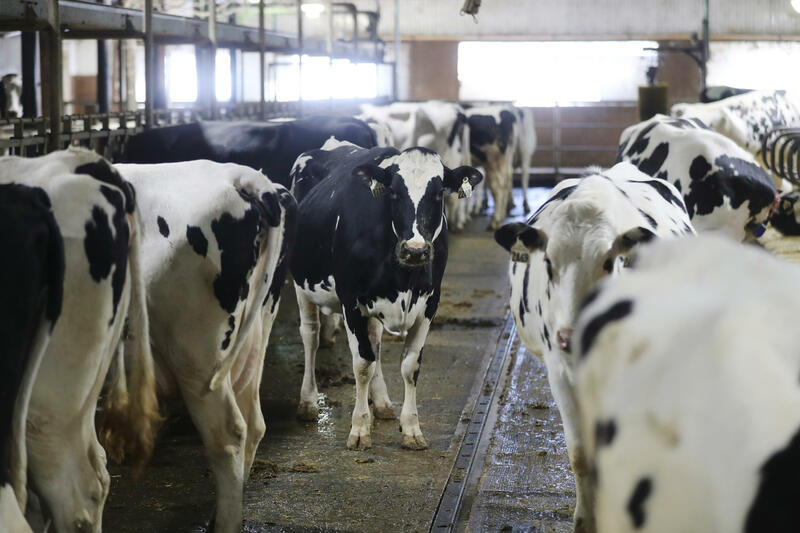 Last year, it exported more than four times the amount Canada sent to the U.S. President Trump is trying to protect dairy farmers in states like Wisconsin and New York. Some of them are going under, but that's because there's still a glut of milk in the U.S. Canadian dairyman Sherk says the U.S. can't blame Canada for that. MURRAY SHERK: By somehow opening up the Canadian market to American producers, it is not going to solve their overproduction problem. What they need to have is some way of controlling production because the market just gets flooded. NORTHAM: But tariffs of 241 percent, 300 percent? 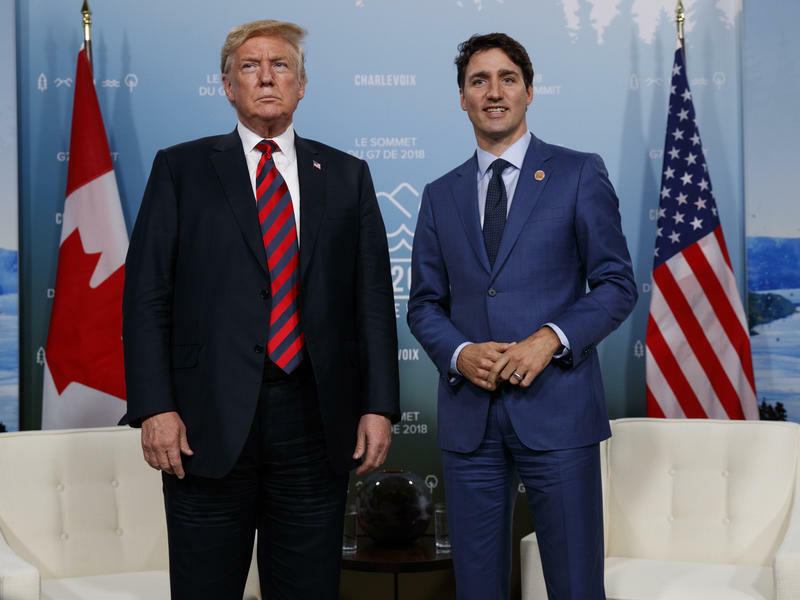 Sylvain Charlebois, a professor in food distribution and policy at Dalhousie University, says even before Trump's criticism, there were reasons to reconsider Canada's supply management system. SYLVAIN CHARLEBOIS: I do think that Mr. Trump is looking at a system that is a bit archaic, to be honest. And I would say that if we are to become trade-focused as a nation in Canada, we have to supply management on the table if we want to be taken seriously. NORTHAM: But that could mean more competition between Canadian and U.S. milk. And it would mean changing a 40-year-old system in Canada that dairy farmers and politicians here are loath to give up, despite pressure from the Trump administration. Jackie Northam, NPR News, Plattsville, Ontario. (SOUNDBITE OF DEEB'S "FLUID DYNAMICS") Transcript provided by NPR, Copyright NPR. In a large, brightly lit grocery store in Canada's capital Ottawa, Scott Chamberlain smoothly navigates his shopping cart through the produce section, looking for ingredients to make chili. He snaps up a bag of red peppers, clearly stamped "Product of Canada." But the only onions available are from the U.S. He reaches for Canadian-grown leeks instead. Tuesday's headlines are all about President Donald Trump's historic summit with North Korean leader Kim Jong Un, but it was just a few days ago that Trump lashed out at one of the United States' closest allies: Canada. Two issues of concern have cropped up recently for Vermont's maple sugar producers. The Trump administration's latest move to impose tariffs on steel and aluminum imports from the U.S.'s biggest strategic and trade partners has touched off a barrage of criticism and retaliation.